Pay attention to warning signs. More importantly, pay attention to your intuition. 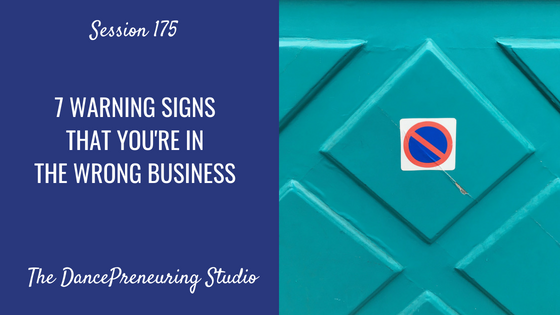 This session on 7 warning signs that you’re in the wrong business was difficult to record because I still wanted to keep it as positive as possible. Step to Success: A step to your success is anything that moves your life and your business forward. Whether it’s an app, a book or an idea, you can apply something today that can help you succeed. Today’s step to success is using whatever you need to stay hydrated. I love my Takeya Water Bottle. Dancer’s Dialect: The Dancer’s Dialect is the dancer’s language. I share dance terminology and concepts across different genres so you can see the correlations in your life and in your business. Today’s concept is based on my recent experience at a backhanding workshop at my yoga studio. 1. Your treatment is conditional. 2. They promote their definition of success over your definition of success. 3. They ridicule other businesses and people, whether publicly or privately. 4. You are not passionate about the product or service. 5. They teach based on theory and speculation. 6. They instill fear and guilt in you if you decide to pursue other projects. 7. They pressure you to spend money that you don’t have.